If you want improvements to cycling and walking in Greater Manchester – it seems now really is the time to get involved. That’s because there’s now more funding, resources and political appetite being directed to improving our city’s travel infrastructure and policies – something we know is so badly needed. But with so many priorities, and only so much cash, time and personnel to go around, it’s vital we do all we can to keep the pressure up – there are two active city wide feedback mechanisms currently live and a host of public consultations to come, as well as future funding bids to influence. There’s a lot going on and four of our 10 districts – Manchester, Salford, Stockport and Trafford – have their own cycle forums that are open to the public so go along if you want to get involved. 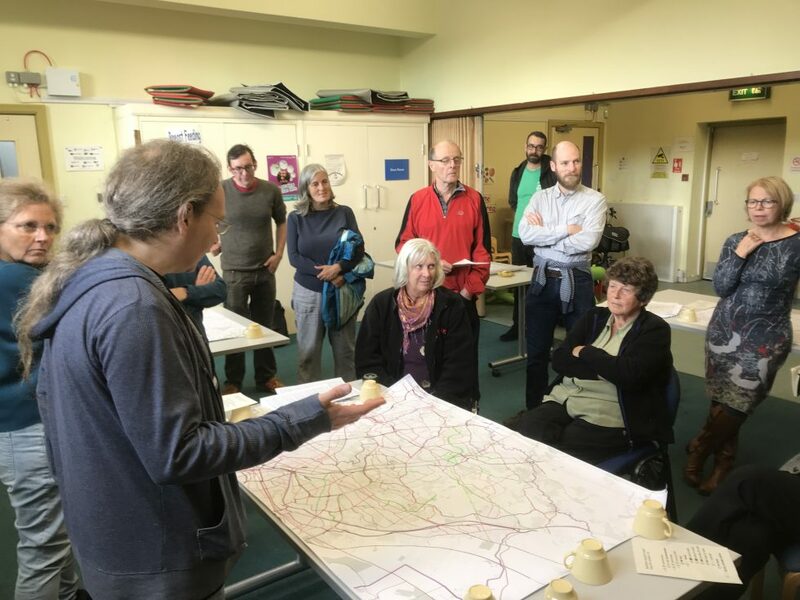 Here’s a roundup from September’s Manchester Cycle Forum – a place where councillors, officers, lobby groups, charities and members of the public come together. This is the largest, most expensive of the 15 schemes to be funded through the first tranche of the Mayor’s new £160m Walking and Cycling Challenge Fund (locals will note there was a Chorlton cycleway scheme knocking about for a few years – new investment has enabled this to be significantly upgraded). TfGM have committed to this being a ‘high-quality, segregated’ route – though it remains to be seen what proportion can be fully segregated given the challenges along the proposed route – such as narrow sections, shop fronts, residences, parking bays. TfGM/Manchester city council have pushed back publishing the route/public consultation several times to allow more work to be done on the scheme due to these complexities – but the latest news is this will happen at the end of October. The consultation will take the form of info packs/flyers published online as well as circulated to affected businesses and residences, and four public meetings – two in Chorlton, and two in other districts (the route travels through/along Chorlton Park, Chorlton, Hulme, Whalley Range, Moss Side). It will be vital that those who support improved cycling and walking make themselves heard during this consultation, as the implications on car users – in particular along Barlow Moor Road before and after the junction with Wilbraham Road (known by all locally as ‘the four banks’) – will be significant. In advance of that consultation, local councillors including Chorlton’s Eve Holt are hosting a public meeting on Saturday 29th September, 12-2pm in Chorlton Library, to discuss cycling and walking generally; so do get along to find out more or to make your voice heard. TfGM very recently released details of the next six schemes recommended for funding, subject to approval. Given phase one included a promise that each of the 10 districts would benefit, if nothing else this indicates which councils are making the most of the Challenge Fund. Salford looks like it has stolen a march on the other districts with three of the six proposals and three-quarters of the funds in this round (the others coming from Trafford, Wigan and Stockport). The £160m Challenge Fund (actually just the first slice of the £1.5bn needed over the coming years) contains money for building schemes (aka ‘capital’) and the current arrangements require councils to develop proposals using their own resources, with funding only released once designs are finalised and a contractor is ready to build the scheme. This has meant some councils are being slow to develop schemes in response to this opportunity. “It has been a challenge to build up the capacity. Councils have not had the staff.” said Martin Key, Senior Transport Advisor to Boardman, at the forum. TfGM also say they have released a small pot of funding to the Sustainable Journeys Team to pay for working with communities. This sounds promising – if you think your community could benefit then make a case ! The mayor appointed ex-Olympic cyclist Chris Boardman as his cycling and walking commissioner, and decisions on how the £160m Challenge Fund will be spent across GM, will be informed by Boardman’s Made to Move strategy. (TLDR: Boardman’s key point is that to really affect change and reduce car-use across the region, policies and funding need to be focused on persuading those who use a car to travel short journeys (2km or less), to walk or cycle instead. (About 250m car journeys of less than 1km are made every year in GM). Following Made to Move, Boardman’s team/TfGM announced Beelines – their take on how that ’12-year-old’ standard could be implemented across the city. The first draft of the proposed Beelines network is currently in active public consultation – take a look and add your comments! GMCC and others have held various meetings to help stimulate feedback – as well as the Chorlton event detailed above there are events 7-9pm this Thursday in Bury and Prestwich to consider what Beelines means for those areas. However, there seems to have been little official publicity about the Beelines map consultation and I believe not enough people realise this important means of feedback is waiting for their input. TfGM/Boardman’s team are pleased there have been more than 3,500 comments – however it seems likely many of these will have been multiple comments from single individuals, and the number of individual users who have commented could be only in the hundreds. This initial consultation (the map will be an ongoing tool) ends at the end of September – so it’s crucial people don’t miss out. If you haven’t already, give it a click and leave a comment on a route you care about. It’s been only a few weeks since Mobike announced it was pulling out of Manchester (those in the council point out it was only ever intended as a trial) so it was really interesting to hear two detailed reports on use of Mobike. Boardman’s representative at the forum, Martin Key, repeated the team’s stated desire to find a new scheme as quickly as possible. But based on this report, it seems we have more to do to find a scheme that will persuade those who do not already have access to a bike, to use a share/ hire scheme. There was good news on this sorely needed link between the city’s two key public transport hubs – in that the plans are finalised and public consultation will begin in October. According to documents submitted last December, the proposed route from Piccadilly will be via Dale Street, Thomas Street, and Withy Grove – with a west to east alternative route also being developed from Victoria via Hannover Street and Shudehill to Thomas Street and back to Piccadilly. Thomas Street – two-way cycling along existing one-way road. A key element of these improvements will include replacing the bridge at Jackson’s Boat pub (distinctive green metal design, built in 1881). Trafford say this is so the crossing can be wider (up to 4m) and more accessible. A petition against removing this landmark gained 4,000 signatures after this was first mooted last year and seems to have been revived in the wake of these developments. See latest designs for the new construction here, these will go to public consultation ‘in the autumn’ with planning permission being sought ‘in winter 2018’ and builders on site some time in 2019. Further information about the routes was made available via Trafford Cycle Forum. There is currently a transport survey being circulated by TfGM which will help guide future the city’s future transport policy – it’s vital we all add our feedback to this if we want our views to be taken into account. This would be a great place to add your bike-friendly ideas that don’t necessarily fit the Beelines map format – eg like calling for bikes to be allowed on trams! Incidentally, this is a great blog post by Nick Hubble, weighing up the merits of various forms of transport – no prizes for guessing which one wins! This section of Deansgate could easily accommodate cycleways like Oxford Road’s. Tell TfGM you want them ASAP! In public meetings about walking and cycling across the city, pavement parking comes up repeatedly as an issue that needs sorting. There may be a nugget of good news, as apparently Andy Burnham asked in the July GM Combined Authority meeting, for a working group to be set up to set out options for how this can be tackled. This will look at the range of powers GM could use – at a city, district and street level. Work has started on transforming this building on the bridge above the Fallowfield loop – you may have seen social media posts about the campaign to help raise funds to turn it into a café and community resource. At the time of writing, it looks like it’ll go to the wire as the team need more than £9k in the six days they have left – though money has been coming in thick and fast. So if you were thinking of giving/ like the sound of the scheme, now is the time to do it! Brian Deegan (street design export and technical advisor to Boardman), Sue Stevenson (Head of Highways and Transportation at Stockport council) and transport consultants Steve Essex (Ex-Manchester City Council) and Jon Little (Waltham Forest) are among the speakers at a North West Active Travel Network event in Manchester on 10th October to discuss how to improve town centres.